Enjoy comfortable navigation on the go with Surface Mobile Mouse. Its light, low-profile design travels well without the bulk of a traditional mouse. Choose from three rich colors-Platinum, Burgundy, and Cobalt Blue. Mix and match with new Surface Go Signature Type Cover, Surface Pro Signature Type Cover, and Surface Pen. Surface Mobile Mouse pairs easily with your Surface using Bluetooth®-no cords or dongle required-making for a clean, clutter-free workspace. What's more, it works on virtually any surface thanks to built-in BlueTrack™ technology. 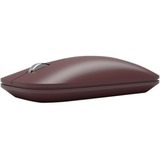 New Surface Mobile Mouse features a smooth, sculpted design with a redesigned wheel that fits comfortably in your hand and supports smooth, natural scrolling.